This past summer produced an order for the world’s first very large ethane carrier (VLEC), shining the industry spotlight on a traditionally niche gas sector whose promise had grown to require a dedicated fleet of ships for intercontinental trade. Classed by ABS, the ships were ordered at Samsung Heavy Industries by India’s largest private-sector enterprise, Reliance Industries, which is aiming to capture the export opportunities presented by the shale gas boom in the United States. At the time of the order, the commodities sector had published many reports about how the U.S. shale boom was generating an abundant supply of comparatively cheap ethane, a byproduct of natural gas. Exports were “imminent,” according to Bentek Energy, an analytical offshoot of Platts, which recently forecast US ethane production to reach 2.5 million barrels per day by 2024, a volume that would see supply exceed demand in the U.S. Other forecasts were even more bullish. However, since Reliance’s July order for six 87,000m3 VLECs at Samsung, the price of oil has undergone a well-publicized decline, which has injected a degree of uncertainty into the market for natural gas liquids (NGL) such as ethane. That is not to say the ethane export market from the U.S. has seen an erosion of its potential; it has not. But the exact timing of when its potential will be realized has become less clear. Most analysts expect the price of oil to eventually rebound, but they differ on whether the present market conditions will last six months, a year, or beyond. NGL’s have evolved within a few short years from being seen as secondary byproducts of gas production to valuable co-products that can drive the economics that dictate gas-production growth. This is particularly so of ‘wet’ gas, natural gas that has a higher level of NGLs present; typically, wet gas can provide as much as 10 times the amount of recoverable liquids than comparable volumes of ‘dry’ gas. The additional revenue potential has forecasters predicting that liquid-rich fields will help to determine the natural gas production levels in the U.S., primarily because the cost of gas production in liquids-rich areas is significantly lower -- and the profits significantly higher -- than in areas that are drilled solely for dry gas. Shale gas production from areas such as Eagle Ford Shale, in Texas, is rich in NGLs – products that, in addition to ethane, include propane, butane and pentanes. These products are separated from the gas at a processing plant. A typical NGL barrel consists of 40-45% ethane, 25-30% propane, 5-10% normal butane, 10% isobutene and 10-15% pentanes. Each product has its own market. 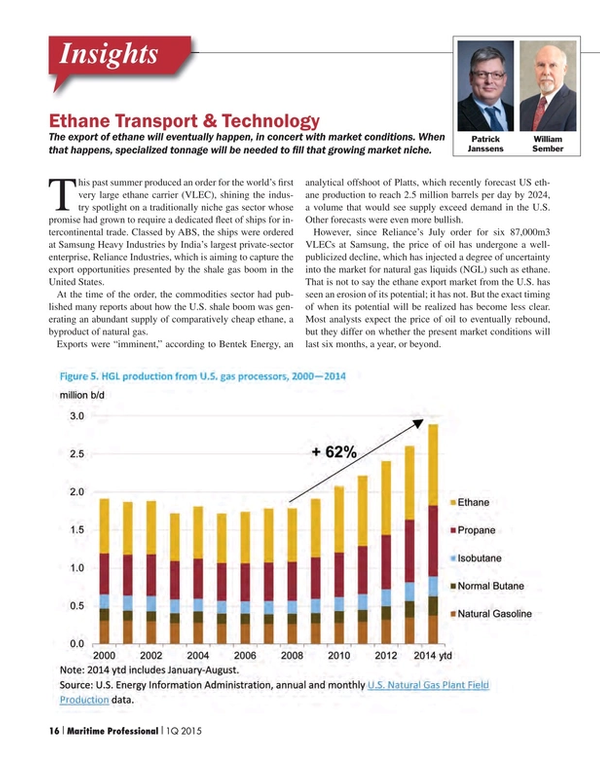 But ethane is mainly used by the petrochemical industry as a feedstock for ethylene (naphtha can also be used, but it is much more expensive). According to the International Energy Agency, in the first eight months of this year, the United State’s production of Hydrocarbon Gas Liquids reached 3.65 million barrels per day (1.07mbpd of which was ethane), putting it among the very top non-OPEC liquids producers. Declining oil prices may have since slowed fracking activities, but the industrial value of ethane to petrochemical manufacturers remains high. The challenge is in transporting it, particularly overseas, in volumes that make economic sense. At its core, that challenge is a technical one. Because ethane is relatively difficult to liquefy and transport in bulk, it has traditionally not been traded in global markets, finding a home instead in facilities adjacent to where it is processed. Ethane must be refrigerated to a low temperature, compressed to a high pressure, or a combination of both to be transported by sea. These factors limit the types of vessels that are capable of transporting the product in its liquid state. To liquefy petroleum gases for maritime transport their temperatures need to be lowered; lighter gases require lower temperatures. For example, a heavier gas such as Butane is cooled to just below 0⁰ C, propane is cooled to about -50⁰ C, ethane to about -90⁰ C and methane all the way down to -162⁰ C.
The more the temperature of the gas has to be lowered to reach its liquid state, the greater the number of technical challenges that arise to cool and transport it, making ethane one of the more technically difficult gasses to ship. At present, ethane-capable ships suitable for long-haul transport are in very short supply, and none of those currently operating would offer the kind of economies of scale sought by overseas traders. Of the existing gas-carrying fleet, only ethylene carriers are equipped to transport ethane; generally, these types of ships are equipped with Type ‘C’, semi-pressurized containment systems. Because ethane has historically been delivered in relatively small parcels, many of that class of ships are relatively small by today’s gas-ship standards. But they remain in demand: about 70% of the existing fleet of 160-odd ethylene-capable carriers offers a cargo capacity of 10,000 cubic meters or less. This, however, puts economic constraints on multinational petrochemical manufacturers that would like to move ethane on the long-haul trades, such as those from the U.S. to Asia or Europe. Typically, the world’s fleet of Very Large Gas Carriers, those with cargo-carrying capacity that exceeds 75,000 cubic meters that are typically designed to transport LPG, feature single-hull, Type ‘A’ prismatic tanks that are fully refrigerated and utilize the ships’ hulls as secondary barriers to contain any cargo leak. However, regulations don’t allow that type of design to be used for the carriage of cargoes (such as ethane) that need to be transported at temperatures below -55⁰ C. Accordingly, the International Code for the Construction and Equipment of Ships Carrying Liquefied Gases in Bulk (IGC Code) generally requires ethane to be transported in a double-hulled vessel when adopting prismatic tanks. The present options for ethane containment systems include: Pressure vessels (cylindrical, bi-lobe or tri-lobe type “C” tanks), membrane tanks (as used for many LNG carriers), spherical tanks, prismatic tanks with a partial secondary barrier, or prismatic tanks with a full secondary barrier that is independent from the ship’s hull structure. Several versions of the latter category are presently under development in northern Europe. The ethane-carrying fleet is showing the potential for incremental growth, both in the number of ships and their unit carrying capacities: there are more than 40 ethylene-capable ships with cargo capacities in the 10,000 to 36,000 cubic meter range presently on order. But these ships will not offer the same potential economies of scale that could be available to VLECs exporting U.S. ethane. As of Feb 1, the only ships on order above 70,000 cubic meters are those classed by ABS and being built by Samsung. ABS was awarded the class contract for a series of four 35,000 cubic meter ethane/ethylene gas-ships to be built at China’s Jiangnan Shipyard for the UK-based Navigator Gas. These LNG-fuelled ships, which will feature bi-lobe type cargo systems, will be the largest gas carriers capable of carrying ethane upon their delivery. The VLECs under construction for Reliance in Korea will feature a GTT Mark III membrane system, insulated with reinforced polyurethane foam, similar the Mark III membrane system used for LNG carriers. From a design and construction perspective, the VLECs are a rather straight-forward application of existing technologies. The cargo-containment systems are generally based on existing LNG systems presently being used, and the reliquefaction equipment and processes are likewise based on existing ethylene carrier designs. Where it becomes a bit more complex is if a shipowner or operator also wants their new ships to burn the ethane cargo as fuel. Unlike LNG carriers that burn a portion of their cargo for fuel, burning ethane is presently not permitted by the IGC Code. However, the new gas code that will enter into force in 2016 contains provisions for considering alternative low flash-point fuels. At present, any ethane-as-fuel option for commercial shipping would have to be explicitly approved by the flag state, and would typically need to be accompanied by a comprehensive risk assessment carried out under the provisions of the new IGC. The engine manufacturer MAN Diesel is developing their ME-GI engines to burn ethane and recently have taken the first orders for ethane-burning engines, with first production units in 2016. Another present constraint on the potential for ethane exports from the U.S. is domestic production capacity; nearly all the capacity of US chemical companies to process ethane is being used, delaying the development of long-term demand. Some relief could come from proposed ethane export terminals slated for the Houston Ship Channel and near Marcus Hook, Pennsylvania, which are designed to provide an annual export capacity of more than 100 million barrels when completed. Enterprise Product Partners is behind the Texas endeavor, a fully refrigerated ethane export facility designed to have an aggregate loading rate of up to 240,000 barrels per day. It is expected to begin operations in the third quarter of 2016. With individual VLECs costing in excess of US$100 million per unit, speculative ordering is unlikely in the present market. Even though ethane gas is a potentially promising niche sector, most owners are likely to seek to lessen the risk by having confirmed export contracts, at least in the short term.